There have been multiple Ebola transmission events ,, and more than 20 Ebola outbreaks since the 1970s. , In August 2014, the largest, most sustained, and widespread Ebola outbreak in history was declared a Public Health Emergency of International Concern (PHEIC) by the World Health Organization (WHO). , The WHO was initially notified of the outbreak in March 2014,  after a febrile illness cluster associated with a high case fatality rate in the area of Gueckedou, Guinea, attracted international attention, and was subsequently identified as the viral zoonosis Ebola (EBOV), formerly known as Zaire Ebolavirus (ZEBV). ,,, This deadly member of the family Filoviridae, an enveloped, negative single-stranded RNA virus, is the most virulent of the five family members. The other members of the Ebolavirus family are Sudan (SUDV), Tai Forest (TAFV), Bundibugyo (BDBV), and Reston (RESV) sub-types. , The sequencing data showed that the 2014 outbreak in West Africa was due to infections with a strain of ZEBV, which differed from the viral strains identified in the earlier outbreaks. , For the sake of clarity and uniformity, we will refer to Ebolavirus as EBOV throughout the remainder of this manuscript, unless the mention of specific viral subtype is mandated. The coagulation defects are attributable to the synthesis of the cell surface tissue factor from viral infected macrophages. The ensuing hepatic injury also leads to decreased synthesis of coagulation factors from the liver. The appearance of hemorrhagic symptoms is associated with a worse prognosis, as outlined in the subsequent paragraphs. The clinical presentation of Ebola patients progresses from non-specific 'flu-like' symptoms to multiorgan failure. The mean time from the onset of symptoms to hospitalization is approximately five days. After admission, the mean length of stay in the hospital, the mean time to death, and the mean time to discharge are 6.4 days, 4.2 days, and 11.8 days, respectively. With regard to the symptoms, the fevers may be mild during the initial phase of illness, but may evolve to become more abrupt and high-grade, with associated chills and rigors. Non-specific prodromal symptoms are almost always present comprising mainly of malaise, weakness, anorexia, severe headache, and pain in the truncal and lower back muscles. High fever with relative bradycardia mimicking the presentation of typhoid fever has also been reported. , Progressive, diffuse, erythematous, nonpruritic, maculopapular rash around the face, neck, trunk, and arms usually appears by the end of the first week. On the basis of the observed patient outcomes, the WHO Ebola Outbreak Team has compared the signs and symptoms that were more likely to be present in patients who died. Neurological symptoms (i.e., confusion, coma, unconsciousness); hematological symptoms (i.e., bleeding gums, bloody nose, bleeding from venipuncture sites, vaginal bleeding); and other selected symptoms (i.e., chest pain, cough, difficulty breathing, and sore throat), were associated with greater observed mortality. 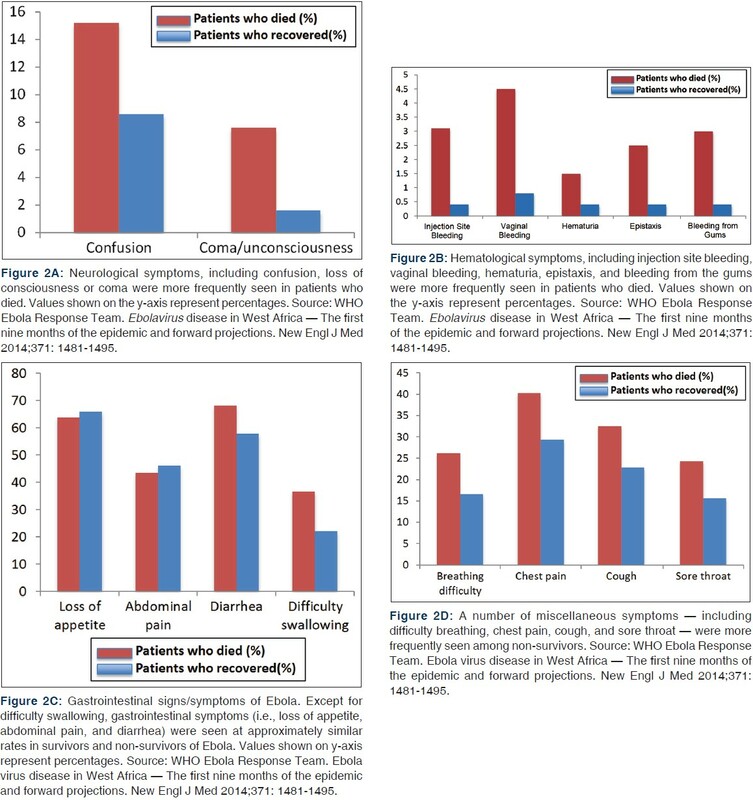 Except for difficulty in swallowing, the presence of gastrointestinal symptoms (i.e., diarrhea, abdominal pain, loss of appetite) did not appear to be associated with increased mortality [Figure 2]c. A detailed summary of the clinical symptoms and signs in survivors and non-survivors is provided in [Figure 2]a-d. Of note, Towner et al. demonstrated that patients who died were found to have higher viral loads. Various derangements in the hematological profile characterized by leukopenia, thrombocytopenia, elevated transaminases, proteinuria, and elevated prothrombin, and thromboplastin times can be seen, and are associated with worse prognosis. The confirmatory diagnosis for Ebola involves detection of the viral antigens or RNA in the blood or other body fluids. Until recently, testing could only be performed in specialized laboratories, and relied on detection of the RNA sequence by reverse-transcription polymerase chain (RT-PCR) reaction or viral antigens by an enzyme-linked immunosorbent assay (ELISA) within three to ten days of onset of symptoms. However, newer rapid diagnostic methods are quickly evolving, , and are expected to be available for deployment in the near future. Patients infected with EBOV, who seek emergency care, expose 'front-line' healthcare workers to significant risk of contracting the infection. ,, Considering the highly contagious nature of the body fluids from individuals with symptomatic infection, dealing with Ebola mandates that healthcare workers follow standard safety precautions rigorously in order to safeguard themselves and the people with whom they interact. The critical nature of the personal protective equipment (PPE) in cases of Ebola and the risk of transmission despite taking apparently adequate precautions is exemplified by the two cases of patient-to-nurse viral transmission in Dallas, Texas,  one case in Spain,  and the recently diagnosed case in New York City. It is important to note that special circumstances requiring heightened vigilance regarding personal protection equipment may arise when caring for patients with Ebola, including the performance of emergency surgery in this population. Successfully combating the current outbreak of Ebola involves coordinated global action. Aggressive investment for early containment efforts is the wisest and the least expensive of all approaches and the global community should come together at this time of crisis to implement a uniform, well-coordinated strategy to prevent catastrophic human and economic losses that may result from inaction. One of the reasons the current outbreak has been more difficult to contain than the earlier Ebola outbreaks is the spread of the disease to areas of high population density, as opposed to the previously seen rural area incidents, where isolation is easier. This may also be a harbinger of what may happen if the virus were to spread to other developing countries with large cities, where millions of low-income residents live in very densely populated areas (i.e., Bangkok in Thailand, Cairo in Egypt, Dhaka in Bangladesh, Lagos in Nigeria, or Mumbai in India). 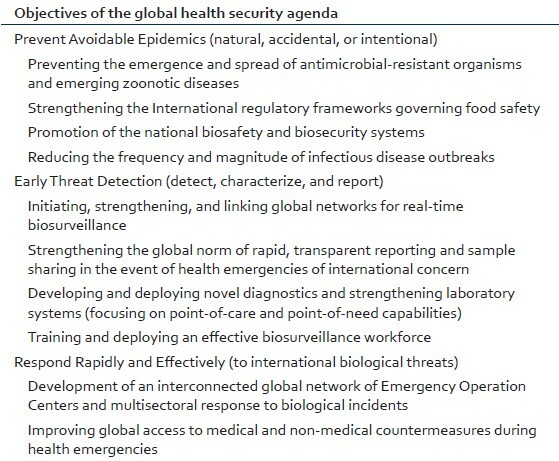 As part of the global health security strategy, the key preventive interventions must include meticulous infection control in healthcare settings, creating awareness and community support for implementation of containment measures, rigorous enforcement of the existing public health protocols, and ample resources to investigate and document any new chain of transmission. Although isolation of suspected cases is likely to be ineffective or impossible under many circumstances, voluntary quarantine and active surveillance can prove helpful. Given all of the above considerations, the time is now for humanity to act as one unified front, against Ebola. Leroy EM, Rouquet P, Formenty P, Souquière S, Kilbourne A, Froment JM, et al. Multiple Ebolavirus transmission events and rapid decline of central African wildlife. Science 2004;303:387-90. Chowell G, Nishiura H. Transmission dynamics and control of Ebolavirus disease (EVD): A review. BMC Med 2014;12:196. Nishiura H, Chowell G. Early transmission dynamics of Ebolavirus disease (EVD). West Africa:, March to August 2014. Euro Surveill 2014;19; pii: 20894. Towner JS, Sealy TK, Khristova ML, Albariño CG, Conlan S, Reeder SA, et al. Newly discovered Ebolavirus associated with hemorrhagic fever outbreak in Uganda. PLoS Pathog 2008;4:e1000212. Klompas M, Diekema DJ, Fishman NO, Yokoe DS. Ebola Fever: Reconciling Ebola Planning With Ebola Risk in U.S. Hospitals. Ann Intern Med 2014 [ In Press]. Farrar JJ, Piot P. The Ebola Emergency - Immediate Action, Ongoing Strategy. N Engl J Med 2014;371:1545-6. Briand S, Bertherat E, Cox P, Formenty P, Kieny MP, Myhre JK, et al. The international Ebola emergency. N Engl J Med 2014;371:1180-3.
WHO Ebola Response Team. Ebolavirus Disease in West Africa - The First 9 Months of the Epidemic and Forward Projections. N Engl J Med 2014;371:1481-95. Baden LR, Kanapathipillai R, Campion EW, Morrissey S, Rubin EJ, Drazen JM. Ebola--an ongoing crisis. N Engl J Med 2014;371:1458-9. Feldmann H, Geisbert TW. Ebola haemorrhagic fever. Lancet 2011;377:849-62. Del Rio C, Mehta AK, Lyon Iii GM, Guarner J. Ebola Hemorrhagic Fever in 2014: The Tale of an Evolving Epidemic. Ann Intern Med 2014 [In Press]. Wauquier N, Becquart P, Padilla C, Baize S, Leroy EM. Human fatal zaire Ebolavirus infection is associated with an aberrant innate immunity and with massive lymphocyte apoptosis. PLoS Negl Trop Dis 2010;4pii:e837. Sullivan NJ, Geisbert TW, Geisbert JB, Shedlock DJ, Xu L, Lamoreaux L, et al. Immune protection of nonhuman primates against Ebolavirus with single low-dose adenovirus vectors encoding modified GPs. PLoS Med 2006;3:e177. Peterson AT, Bauer JT, Mills JN. Ecologic and geographic distribution of filovirus disease. Emerg Infect Dis 2004;10:40-7. Prevention, C.f.D.C.a. Outbreaks chronology: Ebola hemorrhagic fever. 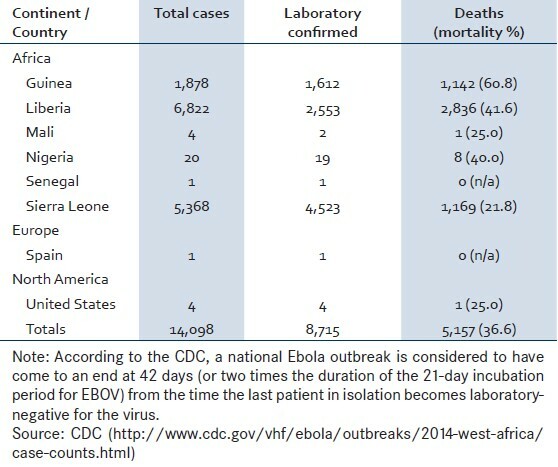 Available from: http://www.cdc.gov/vhf/ebola/resources/outbreak-table.html. [Last accessed on 2014 Oct 13]. Baize S, Pannetier D, Oestereich L, Rieger T, Koivogui L, Magassouba N, et al. Emergence of Zaire Ebolavirus disease in Guinea. N Engl J Med 2014;371:1418-25. CDC. Ebola (Ebolavirus Disease) Transmission. Available from: http://www.cdc.gov/vhf/ebola/transmission/. [Last accessed on 2014 Oct 17]. Gire SK, Goba A, Andersen KG, Sealfon RS, Park DJ, Kanneh L, et al. Genomic surveillance elucidates Ebolavirus origin and transmission during the 2014 outbreak. Science 2014;345:1369-72. Feldmann H, Wahl-Jensen V, Jones SM, Ströher U. Ebolavirus ecology: A continuing mystery. Trends Microbiol 2004;12:433-7. Organization WH. Ebola Response Roadmap situation report 1. 2014; Available from: http://apps.who.int/iris/bitstream/10665/131974/1/roadmapsitrep1_eng.pdf?ua=1). [Last accessed on 2014]. WHO. Mali confirms its first case of Ebola. Available from: http://www.who.int/mediacentre/news/ebola/24-october-2014/en/. [Last accessed on 2014 Oct 28]. McCarthy M. Texas healthcare worker is diagnosed with Ebola. BMJ 2014;349:g6200. McCarthy M. Liberian man being treated for Ebola in Texas dies. BMJ 2014;349:g6145. Euronews. Spanish nursing assistant's husband who overcame Ebola leaves hospital. Available from: http://www.euronews.com/2014/10/27/spanish-nursing-assistant-s-husband-who-overcame-ebola-leaves-hospital/. [Last accessed on 2014 Oct 28]. Flynn L, Bery R, Kaitano AE. Emerging infectious diseases and impact assessments. Available from: http://www.iaia.org/conferences/iaia13/proceedings/Final%20papers%20review%20process%2013/Emerging%20Infectious%20Diseases%20and%20Impact%20Assessments.pdf?AspxAutoDetectCookieSupport=1. [Last accessed on 2014 Nov 6]. House T. Epidemiological dynamics of Ebola outbreaks. Elife 2014;3:e03908. Chan M. Ebolavirus disease in West Africa--no early end to the outbreak. N Engl J Med 2014;371:1183-5. Alirol E, Getaz L, Stoll B, Chappuis F, Loutan L. Urbanisation and infectious diseases in a globalised world. Lancet Infect Dis 2011;11:131-41. Daszak P, Cunningham AA, Hyatt AD. Emerging infectious diseases of wildlife - Threats to biodiversity and human health. Science 2000;287:443-9. Hewlett BS, Amola RP. Cultural contexts of Ebola in northern Uganda. Emerg Infect Dis 2003;9:1242-8. Philips M, Markham A. Ebola: A failure of international collective action. Lancet 2014;384:1181. Halliday J, Daborn C, Auty H, Mtema Z, Lembo T, Bronsvoort BM, et al. Bringing together emerging and endemic zoonoses surveillance: Shared challenges and a common solution. Philos Trans R Soc Lond B Biol Sci 2012;367:2872-80. Mills EJ, Kanters S, Hagopian A, Bansback N, Nachega J, Alberton M, et al. The financial cost of doctors emigrating from sub-Saharan Africa: Human capital analysis. BMJ 2011;343:d7031. Boozary AS, Farmer PE, Jha AK. The Ebola Outbreak, Fragile Health Systems, and Quality as a Cure. JAMA 2014;312:1859-60.
WHO. Unprecedented number of medical staff infected with Ebola. Available from: http://www.who.int/mediacentre/news/ebola/25-august-2014/en/. [Last accessed on 2014 Oct 28]. Youde J. The Ebola outbreak in Guinea, Liberia, and Sierra Leone. E-International relations. Available from: http://www.e-ir.info/2014/07/26/the-ebola-outbreak-in-guinea-liberia-and-sierra-leone/. [Last accessed on 2014 Nov 10]. News B. Ebola contained in Nigeria, Senegal - US health officials. Available from: http://www.bbc.com/news/world-africa-29436851. [Last accessed on 2014 Nov 9]. AFP. Spain Ebola-free in two weeks if no new case. Available from: http://www.thelocal.es/20141013/spain-to-be-ebola-free-by-oct-27th-if-no-new-cases. [Last accessed on 2014 Nov 9]. Smith D, Hoije K. Mali races to head off Ebola outbreak after second death. Available from: http://www.theguardian.com/global-development/2014/Nov/12/mali-ebola-outbreak-second-death. [Last accessed on 2014 Nov 12]. Penney J. Mali quarantines dozens as second Ebola outbreak spreads in country. Available from: http://www.reuters.com/article/2014/11/12/us-health-ebola-mali-idUSKCN0IW12C20141112. [Last accessed on 2014 Nov 12]. Grady D. US scientists see long fight against Ebola. Available from: http://www.nytimes.com/2014/09/13/world/africa/us-scientists-see-long-fight-against-ebola.html. [Last accessed on 2014 Nov 6]. Sengupta S. New Ebola cases may soon reach 10,000 a week, officials predict. Available from: http://www.nytimes.com/2014/10/15/world/africa/ebola-epidemic-who-west-africa.html?_r=0. [Last accessed on 2014 Nov 9]. Farrar JJ, Piot P. The Ebola emergency--immediate action, ongoing strategy. N Engl J Med 2014;371:1545-6. CDC. Outbreak of Hantavirus Infection in Yosemite National Park. 2012 October 17, 2014; Available from: http://www.cdc.gov/hantavirus/outbreaks/yosemite-national-park-2012.html. [Last accessed on 2014 Oct 17]. Shane AL, Roels TH, Goldoft M, Herikstad H, Angulo FJ. Foodborne disease in our global village: A multinational investigation of an outbreak of Salmonella serotype Enteritidis phage type 4 infection in Puerto Vallarta, Mexico. Int J Infect Dis 2002;6:98-102. Boyer ME. Service to "our emerging global village". J Am Vet Med Assoc 1993;202:1817-8. Evans G. Health and security in the global village. World Health Forum 1993;14:133-5. Wilson ME. Infectious diseases in the era of the global village. Salud Publica Mex 1992;34:352-6. Mogul F. New York's disease detectives hit the street in search of Ebola. Available from: http://www.npr.org/blogs/health/2014/10/27/359323578/new-yorks-disease-detectives-hit-the-street-in-search-of-ebola. [Last accessed on 2014 Oct 28]. Stephenson J. CDC: Ebola risk to US patients is low, but clinicians should be on alert. JAMA 2014;312:686. Buchanan L, Copeland B, Yourish K, Trahan Martinez M, et al. Retracing the steps of the Dallas Ebola patient. Available from: http://www.nytimes.com/interactive/2014/10/01/us/retracing-the-steps-of-the-dallas-ebola-patient.html?_r=0. [Last accessed on 2014 Oct 17]. Botelho G, Wilson J. Thomas Eric Duncan: First Ebola death in U.S. Available from: http://www.edition.cnn.com/2014/10/08/health/thomas-eric-duncan-ebola/. [Last accessed on 2014 Oct 17]. Jonsson P. First US Ebola case: Why the delayed diagnosis? Available from: http://www.csmonitor.com/USA/2014/1001/First-US-Ebola-case-Why-the-delayed-diagnosis-video. [Last accessed on 2014 Oct 31]. Botelho G. Nurse may have had symptoms of Ebola longer than first thought. Available from: http://www.edition.cnn.com/2014/10/16/health/us-ebola/. [Last accessed on 2014 Oct 17]. Bever L. Chain reaction: Concern about Ebola nurse's flight prompts school closings in two states. Available from: http://www.washingtonpost.com/news/morning-mix/wp/2014/10/16/after-concern-about-ebola-patients-flight-schools-close-in-two-cities/. [Last accessed on 2014 Oct 17]. CBS. Comparison of contact between two sick nurses and Ebola patient. Available from: http://www.dfw.cbslocal.com/2014/10/15/comparison-of-contact-between-two-sick-nurses-ebola-patient/. [Last accessed on 2014 Oct 17]. Johnson-Delaney CA, University of Washington. Primate Information Center., The filoviridae: Ebola, ebola-like, and marburg viruses in non-human primates: A selective bibliography, 1965-1990. Primate Information Center topical bibliographies. 1990, Seattle, Wash., U.S.A.: Primate Information Center, Regional Primate Research Center. USA: University of Washington. 1990. p. 10. Fisher-Hoch SP. 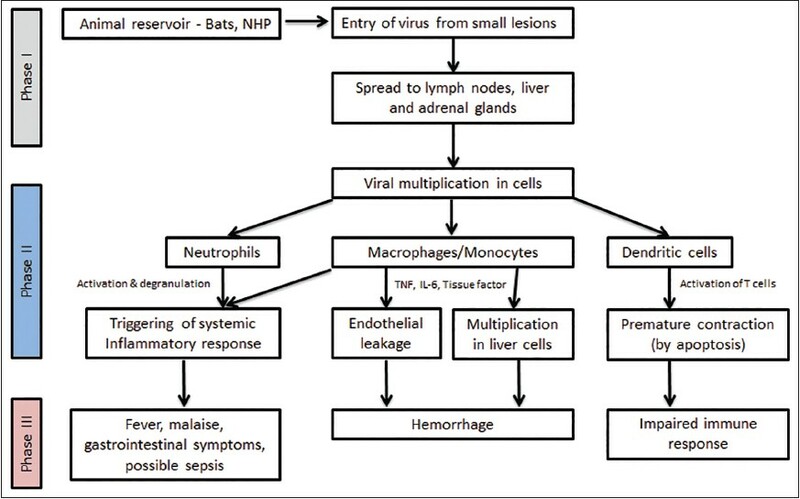 Lessons from nosocomial viral hemorrhagic fever outbreaks. Br Med Bull 2005;73-74:123-37. Slenczka WG. The Marburg virus outbreak of 1967 and subsequent episodes. Curr Top Microbiol Immunol 1999;235:49-75. Ebola haemorrhagic fever in Zaire, 1976. Bull World Health Organ 1978;56:271-93. Bres P. The epidemic of Ebola haemorrhagic fever in Sudan and Zaire, 1976: Introductory note. Bull World Health Organ 1978;56:245.
Cooper C. How the Ebolavirus got its name adn how we caught it from animals. Available from: http://www.independent.co.uk/life-style/health-and-families/how-the-ebola-virus-got-its-name-and-how-we-caught-it-from-animals-9770193.html. [Last accessed on 2014 Oct 17]. Pinzon JE, Wilson JM, Tucker CJ, Arthur R, Jahrling PB, Formenty P. Trigger events: Enviroclimatic coupling of Ebola hemorrhagic fever outbreaks. Am J Trop Med Hyg 2004;71:664-74. Martini GA. Marburg agent disease: In man. Trans R Soc Trop Med Hyg 1969;63:295-302. Siegert R, Shu HL, Slenczka W, Peters D, Müller G. On the etiology of an unknown human infection originating from monkeys. Dtsch Med Wochenschr 1967;92:2341-3. Times T.N.Y. Ebola Facts: How Many People Have Been Sent to Countries With Ebola by Doctors Without Borders? 2014; Available from: http://www.nytimes.com/interactive/2014/07/31/world/africa/ebola-virus-outbreak-qa.html?_r=1. [Last accessed on 2014 Nov 15]. Towner JS, Amman BR, Sealy TK, Carroll SA, Comer JA, Kemp A, et al. Isolation of genetically diverse Marburg viruses from Egyptian fruit bats. PLoS Pathog 2009;5:e1000536. Jin J JAMA patient page: Ebolavirus Disease. JAMA 2014;312:1942. World Health Organization. Barriers to rapid containment of the Ebola outbreak. 2014; Available from: http://www.who.int/csr/disease/ebola/overview-august-2014/en/ [Last accessed on 2014 Nov 15]. Rodriguez LL, De Roo A, Guimard Y, Trappier SG, Sanchez A, Bressler D, et al. Persistence and genetic stability of Ebolavirus during the outbreak in Kikwit, Democratic Republic of the Congo, 1995. J Infect Dis 1999;179(Suppl 1):S170-6. World Health Organization. Travel and transport risk assessment: Guidance for public health authorities and transport sector. 2014; Available from: http://www.who.int/csr/resources/publications/ebola/travel-guidance/en/ [Last accessed on 2014 Nov 15]. Feldmann F, Geisbert TW. Ebola hemorrhagic fever. Lancet 2011;377: 849-62. Centers for Disease Control and Prevention. Ebolavirus Disease Information for Clinicians in U. S. Healthcare Settings. 2014; Available from: http://www.cdc.gov/vhf/ebola/hcp/clinician-information-us-healthcare-settings.html [Last accessed on 2014 Nov 15]. Bray M, Geisbert TW. Ebolavirus: The role of macrophages and dendritic cells in the pathogenesis of Ebola hemorrhagic fever. Int J Biochem Cell Biol 2005;371560-6. Mahanty S, Bray M. Pathogenesis of filoviral haemorrhagic fevers. Lancet Infect Dis 2004;4:487-98. Geisbert TW, Young HA, Jahrling PB, Davis KJ, Larsen T, Kagan E, et al. Pathogenesis of Ebola hemorrhagic fever in primate models: Evidence that hemorrhage is not a direct effect of virus-induced cytolysis of endothelial cells. Am J Pathol 2003;163:2371-82. United States Army Public Health Command. Ebolavirus Disease (Ebola). 2014; Available from: http://phc.amedd.army.mil/topics/discond/diseases/pages/EbolaVirusDisease.aspx [Last accessed on 2014 Nov 15]. Bwaka MA, Bonnet MJ, Calain P, Colebunders R, De Roo A, Guimard Y, et al. Ebola hemorrhagic fever in Kikwit, Democratic Republic of the Congo: Clinical observations in 103 patients. J Infect Dis 1999;179(Suppl 1):S1-7. Sureau PH. Firsthand clinical observations of hemorrhagic manifestations in Ebola hemorrhagic fever in Zaire. Rev Infect Dis 1989;11(Suppl 4):S790-3. Emond RT, Evans B, Bowen ET, Lloyd G. A case of Ebolavirus infection. Br Med J 1977;2:541-4. Towner JS, Rollin PE, Bausch DG, Sanchez A, Crary SM, Vincent M, et al. Rapid diagnosis of Ebola hemorrhagic fever by reverse transcription-PCR in an outbreak setting and assessment of patient viral load as a predictor of outcome. J Virol 2004;78:4330-41. Leonard S. Containing Ebola: 7 next-gen rapid diagnostic tests. Available from: http://www.mddionline.com/article/containing-ebola-7-next-gen-rapid-diagnostic-tests-11-07-14. [Last accessed on 2014 Nov 12]. Madore JT. Chembio diagnostics joining biotech firm to develop rapid test for Ebola. Available from: http://www.newsday.com/business/chembio-diagnostics-developing-rapid-test-for-ebola-1.9550864. [Last accessed on 1014 Nov 12]. Borchert M, Mutyaba I, Van Kerkhove MD, Lutwama J, Luwaga H, Bisoborwa G, et al. Ebola haemorrhagic fever outbreak in Masindi District, Uganda: Outbreak description and lessons learned. BMC Infect Dis 2011;11:357. Mupapa K, Mukundu W, Bwaka MA, Kipasa M, De Roo A, Kuvula K, et al. Ebola hemorrhagic fever and pregnancy. J Infect Dis 1999;179 (Suppl 1):S11-2. Francesconi P, Yoti Z, Declich S, Onek PA, Fabiani M, Olango J, et al. Ebola hemorrhagic fever transmission and risk factors of contacts, Uganda. Emerg Infect Dis 2003;9:1430-7.
de Lamballerie X. Co-ordinating the clinical management of imported human cases suspected of being infected with a highly pathogenic virus such as Ebola. Clin Microbiol Infect 2014 [In Press]. Roddy P, Howard N, Van Kerkhove MD, Lutwama J, Wamala J, Yoti Z, et al. Clinical manifestations and case management of Ebola haemorrhagic fever caused by a newly identified virus strain, Bundibugyo, Uganda, 2007-2008. PLoS One 2012;7:e52986. Joffe S. Evaluating novel therapies during the Ebola epidemic. JAMA 2014;312:1299-300. Kanapathipillai R, Restrepo AM, Fast P, Wood D, Dye C, Kieny MP, et al. Ebola Vaccine - An Urgent International Priority. N Engl J Med 2014 [In Press]. Sobarzo A, Ochayon DE, Lutwama JJ, Balinandi S, Guttman O, Marks RS, et al. Persistent immune responses after Ebolavirus infection. N Engl J Med 2013;369:492-3. McClam E. Dallas nurse Amber Vinson is Ebola-free, will leave hospital. Available from: http://www.nbcnews.com/storyline/ebola-virus-outbreak/dallas-nurse-amber-vinson-ebola-free-will-leave-hospital-n235316. [Last accessed on 2014 Oct 28]. Morse D. Nina Pham, nurse who contracted Ebola, is now free of virus and leaves NIH. Available from: http://www.washingtonpost.com/local/dallas-nurse-treated-for-ebola-at-nih-now-virus-free/2014/10/24/91355cd2-5b8c-11e4-bd61-346aee66ba29_story.html. [Last accessed on 2014 Oct 28]. Bacon J, Owens M. Infected Dallas nurse ID'd; gets transfusion from Ebola survivor. 2014 October 28, 2014; Available from: http://www.usatoday.com/story/news/nation/2014/10/13/ebola-nurse-who/17182599/. [Last accessed on 2014 Oct 28]. Mupapa K, Massamba M, Kibadi K, Kuvula K, Bwaka A, Kipasa M, et al. Treatment of Ebola hemorrhagic fever with blood transfusions from convalescent patients. International Scientific and Technical Committee. J Infect Dis 1999;179(Suppl 1):S18-23. Saul H. Ebolavirus outbreak: Liberia doctor treating patients with HIV drugs reports success. 2014 November 9, 2014; Available from: http://www.independent.co.uk/news/world/africa/ebola-outbreak-liberia-doctor-treating-patients-with-hiv-drugs-claims-13-out-of-15-survived-9759642.html. [Last accessed on 2014 Nov 9]. Zhang Y, Li D, Jin X, Huang Z. Fighting Ebola with ZMapp: Spotlight on plant-made antibody. Sci China Life Sci 2014;57:987-8. Till B. DARPA may have a way to stop Ebola in its tracks. Available from: http://www.newrepublic.com/article/119376/ebola-drug-zmapp-darpa-program-could-get-it-africa. [Last accessed on 2014 Nov 9]. Pollack A. Second drug is allowed for treatment of Ebola. Available from: http://www.nytimes.com/2014/08/08/health/second-experimental-drug-allowed-for-treating-ebola.html?_r=0. [Last accessed on 2014 Nov 9]. Chimerix I. Chimerix's Brincidofovir has in vitro activity against Ebola. Available from: http://ir.chimerix.com/releasedetail.cfm?releaseid=868807. [Last accessed on 2014 Nov 12]. Kroll D. Cimerix's Brincidofovir given to Dallas, Nebraska Ebola patients. Available from: http://www.forbes.com/sites/davidkroll/2014/10/07/chimerixs-brincidofovir-given-to-dallas-nebraska-ebola-patients/. [Last accessed on 2014 Nov 12]. Phillip A. An Ebola vaccine was given to 10 volunteers, and there are 'no red flags' yet. Available from: http://www.washingtonpost.com/news/to-your-health/wp/2014/09/16/an-ebola-vaccine-was-given-to-10-volunteers-and-there-are-no-red-flags-yet/. [Last accessed on 2014 Nov 9]. Fox C. Two anti-Ebola vaccines in historic race. Available from: http://www.dddmag.com/articles/2014/09/two-anti-ebola-vaccines-historic-race. [Last accessed on 2014 Nov 9]. Marketwired. FDA gives New Link Genetics approval to proceed to Phase I clinical studies of their Ebola vaccine. Available from: http://www.investors.linkp.com/releasedetail.cfm?releaseid=869082. [Last accessed on 2014 Nov 9]. Okware SI, Omaswa FG, Zaramba S, Opio A, Lutwama JJ, Kamugisha J, et al. An outbreak of Ebola in Uganda. Trop Med Int Health 2002;7:1068-75. Heymann DL, Barakamfitiye D, Szczeniowski M, Muyembe-Tamfum JJ, Bele O, Rodier G. Ebola hemorrhagic fever: Lessons from Kikwit, Democratic Republic of the Congo. J Infect Dis 1999;179(Suppl 1):S283-6. Hall RC, Hall RC, Chapman MJ. Chapman, The 1995 Kikwit Ebola outbreak: Lessons hospitals and physicians can apply to future viral epidemics. Gen Hosp Psychiatry 2008;30:446-52. Gounder C. To combat Ebola, first build back trust in healthcare workers. Available from: http://www.blogs.reuters.com/great-debate/2014/07/30/efforts-against-ebola-outbreak-hampered-by-victims-lack-of-trust-in-healthcare-workers/. [Last accessed on 2014 Nov 9]. Wolz A. Face to face with Ebola-an emergency care center in Sierra Leone. N Engl J Med 2014;371:1081-3. Kerstiëns B, Matthys F. Interventions to control virus transmission during an outbreak of Ebola hemorrhagic fever: Experience from Kikwit, Democratic Republic of the Congo, 1995. J Infect Dis 1999;179(Suppl 1):S263-7. Baron RC, McCormick JB, Zubeir OA. Zubeir, Ebolavirus disease in southern Sudan: Hospital dissemination and intrafamilial spread. Bull World Health Organ 1983;61:997-1003. Shoichet CE. Ebola: 5 things nurses say the Texas hospital got wrong. Available from: http://www.cnn.com/2014/10/15/health/texas-ebola-nurses-union-claims/. [Last accessed on 2014 Oct 28]. 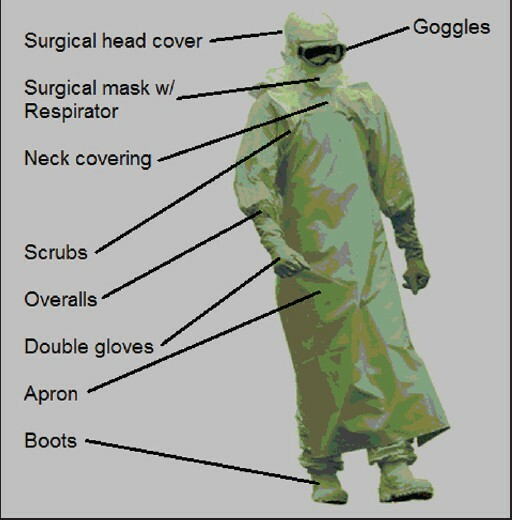 Greenheimer L. Ebola spread shows flaws in protective gear and procedures. 2014 October 28, 2014; Available from: http://www.scientificamerican.com/article/ebola-spread-shows-flaws-in-protective-gear-and-procedures/. [Last accessed on 2014 Oct 28]. Hartocollis A, Santora M. Plenty of hugs as craig spencer, recovered New York Ebola patient, goes home. 2014 November 12, 2014; Available from: http://www.nytimes.com/2014/11/12/nyregion/craig-spencer-new-york-ebola-patient-bellevue.html?_r=0. [Last accessed on 2014 Nov 12]. WHO. How to safely collect blood samples from persons suspected to be infected with highly infectious blood-borne pathogens (e.g. Ebola). 2014 November 9, 2014; Available from: http://www.who.int/csr/resources/publications/ebola/blood-collect-en.pdf. [Last accessed on 2014 Nov 9]. Lippi G, Mattiuzzi C, Plebani M. Laboratory preparedness to face infectious outbreaks. Ebola and beyond. Clin Chem Lab Med 2014;52:1681-4. CDC. Ebola-associated waste management. Available from: http://www.cdc.gov/vhf/ebola/hcp/medical-waste-management.html. [Last accessed on 2014 Nov 5]. Christopher GW, Eitzen EM Jr. Air evacuation under high-level biosafety containment: The aeromedical isolation team. Emerg Infect Dis 1999;5:241-6. Martinez M, Vercammen P, Hannah J. Germ-zapping robot Gigi sets its sights on Ebola. Available from: http://www.cnn.com/2014/10/16/us/germ-zapping-robot-ebola/. [Last accessed on 2014 Nov 9]. Caywood T. WPI explores using robots to treat Ebola. Available from: http://www.telegram.com/article/20141109/NEWS/311099832/1246. [Last accessed on 2014 Nov 9]. Mulvihill J. Ebola's orphans: Survivors care for children left behind by disease. Available from: http://www.foxnews.com/health/2014/11/04/ebolas-orphans-survivors-care-for-children-left-behind-by-disease/. [Last accessed on 2014 Nov 10]. WHO. Liberia: Survivors help train health workers for Ebola care. Available from: http://www.who.int/features/2014/liberia-ebola-survivors/en/. [Last accessed on 2014 Nov 10]. UN. Ebola: Back from outbreak epicentre, UN offical says survivors now helping with care. Available from: http://www.un.org/apps/news/story.asp?NewsID=49108#.VGDVOMkfKQo. [Last accessed on 2014 Nov 10]. Kumana CR, Cheung BM, Chan LS. Airport screening for Ebola: Current thermal scanning procedures are unreliable. BMJ 2014;349:g6571. Mabey D, Flasche S, Edmunds WJ. Airport screening for Ebola. BMJ 2014;349:g6202. Parkes-Ratanshi R, Elbireer A, Mbambu B, Mayanja F, Coutinho A, Merry C. Ebola outbreak response; Experience and development of screening tools for viral haemorrhagic fever (VHF) in a HIV center of excellence near to VHF epicentres. PLoS One 2014;9:e100333. McCarthy M. US increases Ebola screening at five airports. BMJ 2914;349:g6147. Gulland A. Experts question usefulness of screening travellers to UK for Ebola. BMJ 2014;349:g6199. St John RK, King A, de Jong D, Bodie-Collins M, Squires SG, Tam TW. Border screening for SARS. Emerg Infect Dis 2005;11:6-10. Pitman RJ, Cooper BS, Trotter CL, Gay NJ, Edmunds WJ. Entry screening for severe acute respiratory syndrome (SARS) or influenza: Policy evaluation. BMJ 2005;331:1242-3. Feldman, J. Schools in Texas, Ohio close over Ebola panic. Available from: http://www.mediaite.com/online/schools-in%C2%A0texas-ohio-close-over-ebola-panic/. [Last accessed on 2014 Nov 9]. Luyten J. Mutual moral obligations in the preventin of infectious diseases, in Justice, Luck and Responsibility in Health Care. Denier Y, et al. [Eds]. Springer Netherlands, 2014; p. 85-100. Thacker SB, Berkelman RL. Public health surveillance in the United States. Epidemiol Rev 1988;10:164-90. CDC. CDC announces active post-arrival monitoring for travelers from impacted countries. 2014 November 12, 2014; Available from: http://www.cdc.gov/media/releases/2014/p1022-post-arrival-monitoring.html. [Last accessed on 2014 Nov 12]. Allaranga Y, Kone ML, Formenty P, Libama F, Boumandouki P, Woodfill CJ, et al. Lessons learned during active epidemiological surveillance of Ebola and Marburg viral hemorrhagic fever epidemics in Africa. East Afr J Public Health 2010;7:30-6. Tambo E, Ugwu EC, Ngogang JY. Need of surveillance response systems to combat Ebola outbreaks and other emerging infectious diseases in African countries. Infect Dis Poverty 2014;3:29. Gostin LO. Public health law: Power, duty, restraint. Rev. and expanded. 2 nd ed. Berkeley: California/Milbank Books on Health and the Public; 2008. New York Milbank Memorial Fund. New York: University of California Press; Smith RE. Quarantine and isolation. Br Med J 1952;2:34-6. Gostin LO. Public health law: Power, duty, restraint. California/Milbank series on health and the public. Milbank Memorial Fund. Berkeley New York: University of California Press; 2000. p. 491. Markovits D. Quarantines and distributive justice. J Law Med Ethics 2005;33:323-44. Bostick NA, Levine MA, Sade RM. Ethical obligations of physicians participating in public health quarantine and isolation measures. Public Health Rep 2008;123:3-8. Gensini GF, Yacoub MH, Conti AA. The concept of quarantine in history: From plague to SARS. J Infect 2004;49:257-61. Hawryluck L, Gold WL, Robinson S, Pogorski S, Galea S, Styra R. SARS control and psychological effects of quarantine, Toronto, Canada. Emerg Infect Dis 2004;10:1206-12. Zernike K, Fitzsimmons EG. Threat of lawsuit could test Maine's quarantine policy. Available from: http://www.nytimes.com/2014/10/30/us/kaci-hickox-nurse-under-ebola-quarantine-threatens-lawsuit.html?_r=0. [Last accessed on 2014 Nov 10]. Gregg C. Ebola nurse forced into quarantine in N.J. contemplates civil rights lawsuit. Available from: http://philadelphia.cbslocal.com/2014/10/27/ebola-nurse-forced-into-quarantine-in-n-j-contemplates-civil-rights-lawsuit/. [Last accessed on 2014 Nov 10]. Drazen JM, Kanapathipillai R, Campion EW, Rubin EJ, Hammer SM, Morrissey S, et al. Ebola and Quarantine. N Engl J Med 2014 [In Press]. Bensimon CM, Upshur RE. Evidence and effectiveness in decisionmaking for quarantine. Am J Public Health 2007;97(Suppl 1):S44-8. Chowell G, Fuentes R, Olea A, Aguilera X, Nesse H, Hyman JM. The basic reproduction number R0 and effectiveness of reactive interventions during dengue epidemics: The 2002 dengue outbreak in Easter Island, Chile. Math Biosci Eng 2013;10:1455-74. Legrand J, Grais RF, Boelle PY, Valleron AJ, Flahault A. Understanding the dynamics of Ebola epidemics. Epidemiol Infect 2007;135:610-21. Mitman G. Ebola in a Stew of Fear. N Engl J Med 2014;371:1763-5. Wynia MK. Ethics and public health emergencies: Restrictions on liberty. Am J Bioeth 2007;7:1-5. Izadi E. Nigeria's Ebola outbreak may be coming to an end. Available from: http://www.washingtonpost.com/news/to-your-health/wp/2014/09/30/nigerias-ebola-outbreak-may-be-coming-to-an-end/. [Last accessed on 2014 Nov 12]. Murphy, T. Ebola cases fall in Liberia, rise in Sierra Leone, and concerns persist. Available from: http://www.humanosphere.org/global-health/2014/11/calls-increased-efforts-amid-promising-worrying-progress-ebola/. [Last accessed on 2014 Nov 12]. Green A. Ebola emergency meeting establishes new control centre. Lancet 2014;384:118. Muyembe-Tamfum JJ, Kipasa M, Kiyungu C, Colebunders R. Ebola outbreak in Kikwit, Democratic Republic of the Congo: Discovery and control measures. J Infect Dis 1999;179(Suppl 1):S259-62. Bah SM, Aljoudi AS. Taking a religious perspective to contain Ebola. Lancet 2014;384:951. Charlton C. Bribery breaks out in battle against Ebola: Liberian victims' families paying corrupt retrieval teams to keep bodies so they can give them traditional burials. Available from: http://www.dailymail.co.uk/news/article-2791911/bribery-breaks-battle-against-ebola-liberian-victims-families-paying-corrupt-retrieval-teams-bodies-traditional-burials.html. [Last accessed on 2014 Oct 28]. Lamunu M, Lutwama JJ, Kamugisha J, Opio A, Nambooze J, Ndayimirije N, et al. Containing a haemorrhagic fever epidemic: The Ebola experience in Uganda (October 2000-January 2001). Int J Infect Dis 2004;8:27-37. Muyembe T, Kipasa M. Ebola haemorrhagic fever in Kikwit, Zaire. International Scientific and Technical Committee and WHO Collaborating Centre for Haemorrhagic Fevers. Lancet 1995;345:1448. Guimard Y, Bwaka MA, Colebunders R, Calain P, Massamba M, De Roo A, et al. Organization of patient care during the Ebola hemorrhagic fever epidemic in Kikwit, Democratic Republic of the Congo, 1995. J Infect Dis 1999;179(Suppl 1):S268-73. Harman S. Ebola and the politics of a global health crisis. Available from: http://www.e-ir.info/2014/10/20/ebola-and-the-politics-of-a-global-health-crisis/. [Last accessed on 2014 Nov 10]. Gomez DO. New international agencies for a global village. Salud Publica Mex 2003;45:333-4. Inglesby T, Fischer JE. Moving ahead on the global health security agenda. Biosecur Bioterror 2014;12:63-5. Pillai SK, Nyenswah T, Rouse E, Arwady MA, Forrester JD, Hunter JC, et al. Developing an incident management system to support ebola response - liberia, july-august 2014. MMWR Morb Mortal Wkly Rep 2014;63:930-3. Schneider P. Toward a global medical village. Healthc Inform 1997;14:26-34. Stawicki SP, Stoltzfus JC, Aggarwal P, Bhoi S, Bhatt S, Kalra OP, et al. Academic College of Emergency Experts in India's INDO-US Joint Working Group and OPUS12 Foundation Consensus Statement on Creating A Coordinated, Multi-Disciplinary, Patient-Centered, Global Point-of-Care Biomarker Discovery Network. Int J Crit Illn Inj Sci 2014;4:200-8. Marchigiani R, Gordy S, Cipolla J, Adams RC, Evans DC, Stehly C, et al. Wind disasters: A comprehensive review of current management strategies. Int J Crit Illn Inj Sci 2013;3:130-42. Press A. CDC report predicts as many as 1.4 million cases of Ebola by January. 2014 November 10, 2014; Available from: http://www.foxnews.com/health/2014/09/23/who-forecasts-more-than-20000-ebola-cases-by-november-2/. [Last accessed on 2014 Nov 10]. Rid A, Emanuel EJ. Why should high-income countries help combat Ebola? JAMA 2014;312:1297-8. Bier J. General: If Ebola reaches Central America, 'There will be mass migration into the U.S.'. Available from: http://www.weeklystandard.com/blogs/general-if-ebola-reaches-central-america-there-will-be-mass-migration-us_810793.html. [Last accessed on 2014 Nov 9]. Uhlmann, C. Must stop Ebola from getting to Asia: Volunteer doctor. Available from: http://www.abc.net.au/news/2014-10-17/health-minister-defends-australias-ebola-response/5821036. [Last accessed on 2014 Nov 10]. Charles J, Wyss J. Ebola fears spur travel bans in Latin America, Caribbean. Available from: http://www.miamiherald.com/news/nation-world/world/americas/article3073953.html. [Last accessed on 2014 Nov 9]. UN. United Nations Development Program. Sustaining human progress: Reducing vulnerabilities and building resilience. Available from: http://www.undp.org/content/undp/en/home/librarypage/hdr/2014-human-development-report.html. [Last accessed on 2014 Nov 10]. Bausch DG, Schwarz L. Outbreak of Ebolavirus disease in Guinea: Where ecology meets economy. PLoS Negl Trop Dis 2014;8:e3056. Kottasova I. World Bank: Cost of Ebola could top $32 billion. Available from: http://edition.cnn.com/2014/09/24/business/ebola-cost-warning/. [Last accessed on 2014 Nov 5]. Hamilton R. Ebola crisis: The economic impact. Available from: http://www.bbc.com/news/business-28865434. [Last accessed on 2014 Nov 10]. Mirzayev E. Ebola's economic impacts on Liberia, Sierra Leone and Guinea. Available from: http://www.investopedia.com/articles/investing/101314/ebolas-economic-impacts-liberia-sierra-leone-and-guinea.asp. [Last accessed on 2014 Nov 10]. Schlein L. WHO: $1 billion needed to contain Ebola outbreak. Available from: http://www.voanews.com/content/ebola-outbreak-who-response-one-billion-dollars/2451347.html. [Last accessed on 2014 Nov 10]. Burki TK. USA focuses on Ebola vaccine but research gaps remain. Lancet 2011;378:389. PHAC-ASPC. Pathogen safety data sheet - Infectious substances. Available from: http://www.phac-aspc.gc.ca/lab-bio/res/psds-ftss/ebola-eng.php. [Last accessed on 2014 Nov 12]. News C. Ebola outbreak: Latest Texas patient taken to Atlanta hospital. Available from: http://www.cbsnews.com/news/ebola-outbreak-latest-texas-patient-to-be-transferred-to-atlanta-hospital/. [Last accessed on 2014 Nov 12]. Keneally M. Second nurse with Ebola arrives at Emory. Available from: http://abcnews.go.com/Health/nurse-ebola-arrives-emory/care involved?[180-182]. [Last accessed on 2014 Nov 12].